Being a man of size doesn't mean you're limited to being a ghost at a dress-up party; there are now dozens of fun options available in big and tall Halloween costumes. Whether you want to buy, rent or make a costume, there's something perfect out there for you. 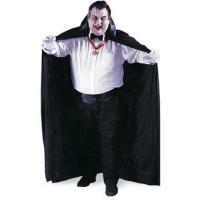 Shopping for a costume online can be your easiest and cheapest option when time and money are major considerations. Several online costume shops have separate sections for big and tall Halloween costumes, making the shopping process that much less annoying. Beer keg--and they're not kidding. This is a tunic with a helmet that has a beverage reservoir that holds almost 14 ounces of any liquid you like, attached to a hand-held nozzle. If you're a shy guy and don't know who's going to be at the party, this costume is a guaranteed ice-breaker. You don't necessarily have to know how to sew to pull together a costume you like. If you have black trousers and a suit jacket, wear them with a white shirt with the collar turned up, a black tie and a bowler hat and a small mustache and you'll be Oliver Hardy. This will be even more fun if you have a friend who wants to be Stan Laurel. Add to the effect by playing with the tie and sporting a rolling, jaunty walk. If you're escorting or otherwise entertaining kids, capitalize on the popularity of Harry Potter by dressing as his friend Hagrid. Wear brown corduroy trousers, black boots, a hip-length beige tunic (this could even be a long john top) and a loose forest-green vest. Add a belt and hang tools and fake dead creatures from it like rats and rabbits. You will need to buy a shoulder-length wig and large beard, which are available in most shops. If you can find it, wear a brown trench coat. Finally, to show just how in the know you are, carry a pink flowery umbrella. The kids will be delighted. 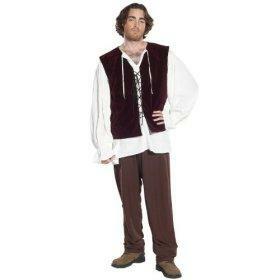 If you are able to construct an excellent Renaissance costume, you can have a lot of fun dressing up as Henry VIII. A Google images search will bring up an excellent full-length portrait to work from. A funny idea for a couple would be the ghost of Anne Boleyn with a nasty scar around the neck. You can even turn it into a group costume and go around with six lovely queens, which is guaranteed to turn the head of every man at the party!